"Leading brands and agencies have known for many years that more creative work delivers better results than ‘safe’ and rational advertising. What has been exciting in more recent times is to see the emerging proof of this; the hard evidence that creative work is more memorable, more effective and more able to drive overall business performance." Debate in the advertising and marketing industries has raged for decades: does creativity make advertising more effective? Or is it just the folly of creative people looking to win their next award? The arguments of both advocates and cynics have until recently been based on conjecture and anecdotal evidence. 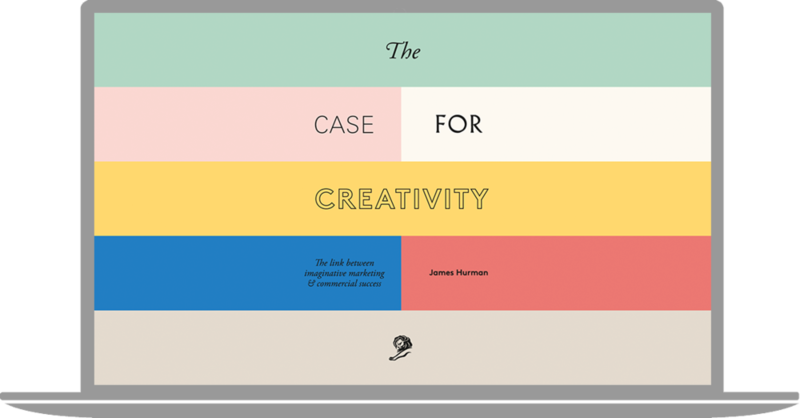 James Hurman’s seminal creative effectiveness book The Case for Creativity, now updated for 2016, brings the debate to a conclusion with three decades of international research into the link between creativity and business results. Advertising with creative award-winning qualities is more effective than advertising in general, and as advertising gets more creative, it gets more effective. The advertising agencies that place emphasis on highly creative work are more efficient at creating highly effective advertising for their clients. Client organisations who've won Creative Marketer of the Year at the Cannes Lions International Festival of Creativity have all done so during record periods of share market performance, demonstrating the link between creative culture and commercial performance. The Case for Creativity is available from Amazon in both paperback and (very soon) Kindle e-book editions. If you would like to place a bulk order for 10 copies or more, please fill in this form and we will respond with pricing. "Practitioner-led, powered by data… utterly convincing. Business will be the richer for embracing this thinking." The Case for Creativity slideshow is a quick 10 page PDF covering the main findings from the book. James Hurman is a New Zealander who spent the majority of his career as a strategic planner in the advertising industry. In 2013 he was named the world’s #1 planning director by the Big Won Report, following many years as head of planning at Auckland agency Colenso BBDO. Equally passionate about creativity and effectiveness, James’ work has won 20 Cannes Lions and more than 50 effectiveness awards. In 2014 James left the advertising industry to found innovation consultancy Previously Unavailable. He lives in Auckland with his wife and children. James can be reached by filling out the form below. Thank you! Your message has been sent to James and he will respond as soon as possible. "The relationship between creativity and effectiveness is the golden thread of advertising, and it is nowhere more eloquently explored than in this brilliant book."